This is an area which appears in many episodes in many different guises. It contains Ben Bheinnie and other locations which appeared in "Wee Jocks Lament", some of the scenery in "A bit of an epic" and 'Wee Macfees Bog' from "The Lochdubh Assassin". It also contains a large population of extremely irritating flies and other biting insects, along with some rather nice attractive dragonflies which have the good manners to refrain from chewing chunks out of your face, arms and legs. 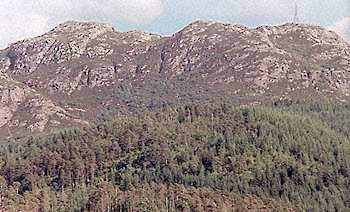 You can drive partway to the summit of this hill which has fine views over Plockton, Loch Carron, the Applecross Hills and Skye. Follow this road past Creag nan Garadh until you reach the T junction. Take the right turning (the left goes to Duncraig Castle)., Follow this road going past Loch Lundie until there is a road on the left sign posted to Achnandarach and Achnahinich. This junction appears in "The Big Freeze"
Follow this road for a mile or so and you will pass over a cattle grid to the side of Loch Achaidh na h-Inich which appears in several episodes. Continue along the side of the loch to a point where the road is blocked by a large gate giving entrance to the forest. It is possible to drive a further mile or so through the forest along the road to its highest point where there is parking space for two or three small cars. Please be warned that this narrow single track road through the forest is in poor condition, has ditches or vertical drops on its sides, and that there are no passing spaces at all on this section of the road i.e. if you meet any vehicle coming the opposite way you (or they) may have to reverse a considerable distance to allow the other vehicle to pass. If you don't want to drive the final section there are several points next to the loch where there is space to park a car. Go through the gate (be sure to shut it afterwards), continue up the hill to the next gate (shut this also), and finally you will come to the small parking space on the right of the road. Next to the parking space a wide track leads off on the right initially down the hill and then upwards to the top of Carn á Bhealaich Mhóir. You will eventually come to a set of large metal gates, on the left side of these is a style somewhat hidden in the bushes. Carry up on the steep track which zig zags up the hill to the TV transmitter mast. Dogs are allowed on the hill but a sign requests that they be kept on a lead because of sheep. Halfway up to the transmitter mast you will pass the spot where Rory, Doc Brown, Lachlan and Lachie Jnr indulge in a bit of 'male bonding' in "Wee Jock's Lament". 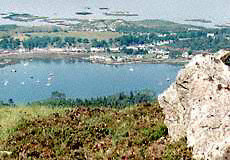 The lochs in the distance appear in quite a few scenes of "A bit of an epic"
Go to the top of the hill at the transmitter mast and the locations can be found within a couple of hundred yards radius of the mast. I'm not giving exact details of the locations to give you a chance to find them for yourself but if you really want to know them just drop me an e-mail. On the edge of the cliffs you will see some signs that filming took place. 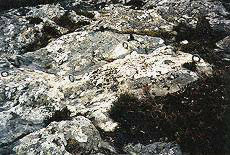 On a largish outcrop of rock there are five or six grey metal rings, used for attaching ropes, sticking out of the rock surface. 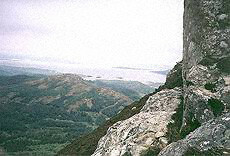 This is the spot (or to be more accurate above the spot) where Hamish Macbeth is seen dangling in "A Bit of an Epic". 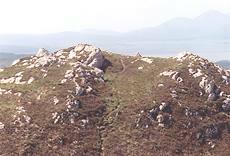 Several of the small rocky hills with cairns on the top of them appear in "Wee Jocks's Lament". Nearby one of the small hills topped by a cairn you will see a small dead tree. To the left of this you will see a number of wooden stakes surrounding some rough disturbed boggy ground. 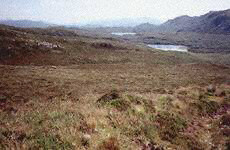 This is the spot which appeared as 'Wee McFees Bog' in "The Lochdubh Assassin". From the top of one of the small hills you will get the view across to the cairn (and the hills of Skye) which appeared in the closing scenes of "Wee Jocks Lament" when TV John plays the bagpipes.